MISL (Meter Integration Service Layer ) has been developed as a web service and a suite of Dynamic Link Libraries (DLL) to allow clients to integrate encoding/decoding of meter messages in their own head end applications or as a fully integrated part of the Generis Focus solution. The application comprises of a SQL Server database and circa 80 callable business functions and supports messages to and from meters and prepayment modules. The calling application invokes a ‘business function’ within the MISL e.g. ScheduleConfig, ReadKWh. 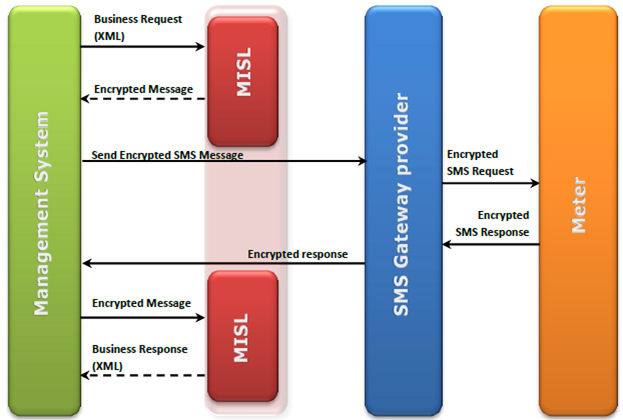 MISL translated the business request to a low level message that the meter understands and encrypts the message. The message is returned as an encoded string by MISL to the calling application. The calling application awaits a response, either requested data or an acknowledgement. Once the response arrives, this is passed by the calling application to MISL for decoding. MISL decrypts the response and coverts the Information to a ‘business response’ and returns the response to the calling application. MISL will also decode/decrypt any unsolicited messages, e.g Daily Schedule Reads, Tamper alarms and return them to the calling application as a ’business response’. Reduce business risk by utilising Generis’ unrivalled expertise in global smart meter hardware & software rollouts.